I've been working on my stack of UFOs (unfinished objects) this week so I thought I'd show you my quilting room. Taffy, one of my Springer Spaniels, and I cleaned up the lint and thread on the floor for the photos, but otherwise this is just how the room looks. No magazine perfection here. I have a portable sewing table made by SewEzi. As you can see in the photo below, it has an inset shelf under to sewing table to position the sewing machine so it is level with the table. It comes with a lucite inset that is made to fit your sewing machine exactly so there are no gaps between the sewing machine and the table. If you have more than one size or brand of sewing machine, you may purchase additional lucite insets for each of them. I have the SewEzi table nested in L made up of 2 rectangular folding tables. This gives me a large working area. I got my folding tables from BJs several years ago, but I'm sure they are available from a number of stores. This table configuration allows me to rest the quilt on the tables to the left of my machine and behind it. There are times when the quilt is in my lap but most of the time I don't have to hold it. I have 2 storage areas in this room. Here you can see a stack of plastic drawers. They contain patterns, stabilizer for machine embroidery, lots of thread, ribbons, ric-rac and other sewing notions. The dogs really do sleep in the room when I'm quilting--my blog title is based on fact! The dogs just weren't around when I took these photos! The other truly wonderful thing about this room is the closet system from Home Depot which my brother installed for me. We purposely set the shelves closely together to maximize the space. It's easy to take out a bin of thread when it's in a short stack. The closet has supplies for embroidery, packaged batting, yarn (not getting used often but I do knit too), computer paper and a few boxes that aren't sewing related which needed a place to be stored. My stash and rolls of quilt batting are upstairs. I know you were wondering where all the fabric is! This isn't the only place I work in my house, but it is the dedicated space for quilting and machine embroidery. The storage is really great. 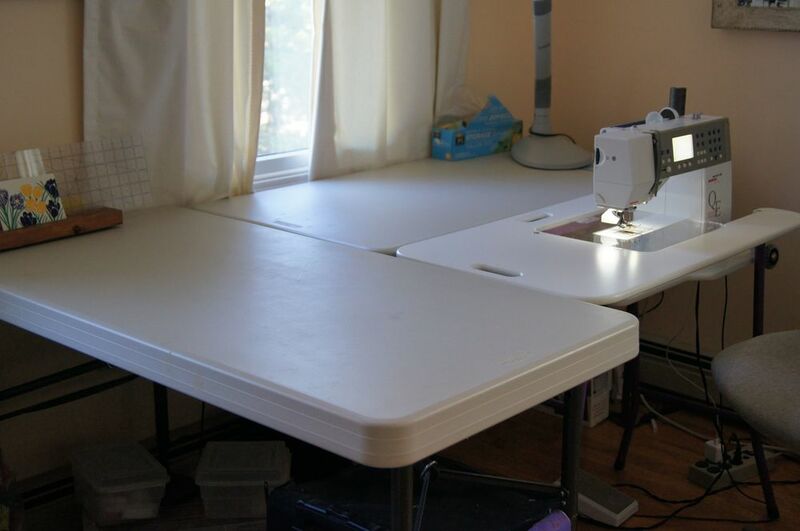 But it's my SewEzi table nested into the L of folding tables which really makes quilting not only doable, but a pleasure. If I need to the room for another use, I can easily fold up my tables. 10 minutes and it's an almost empty room. So this is my quilting set up. I hope it give you some ideas about how to use and maximize your quilting space.